Western Australia’s iconic Gibb River Road isn’t for the faint hearted. The roads are often corrugated, flooded or closed, but you will be well-rewarded with incredible scenery that provide lifelong memories. Fuel Availability: Several roadhouses and pastoral stations sell fuel. Supplies: Basic groceries are available at a few roadhouses and stations but you will need to take most food supplies with you. 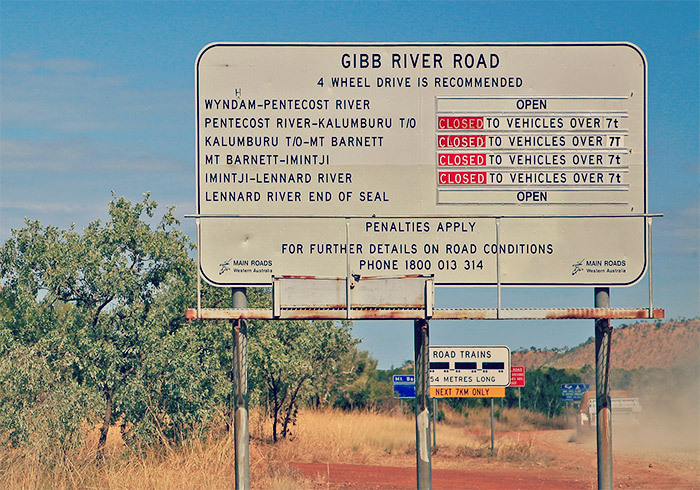 What to Do/See: The Gibb River Road boasts impressive gorges and landscape. Give yourself time to detour off the road to see them. Tips: Estuarine (saltwater) and freshwater crocodiles inhabit the Kimberley. Saltwater crocodiles are the most aggressive and dangerous however freshwater crocodiles can still bite. Gorges and pools can contain both species so beware swimming in the area. Read the crocodile brochure and fact sheet. Pack extra food supplies (long life) in case the road closes overnight because of rain and you can’t leave the campground. 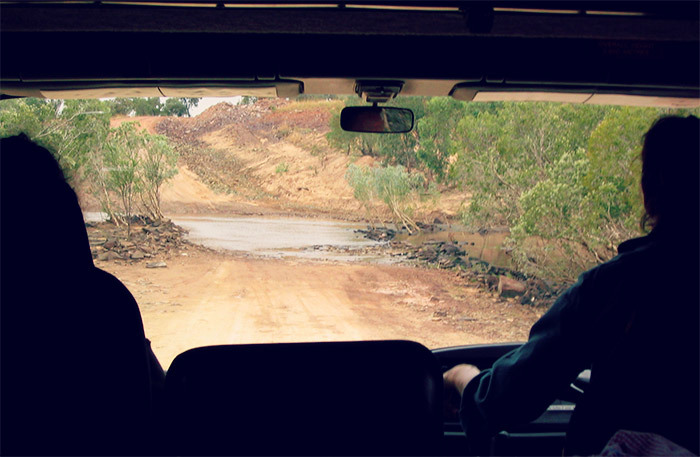 There is an abundance of incredible scenery and adventure along the Gibb River Road. The gorges are some of the most spectacular in the country. Some gorges located in the Gibb River Road region are close to the road but others are isolated and difficult to reach but most visitors agree visiting any gorge is well worth the trek. The walls of the gorge rise a stunning 100 metres into the air. During the dry season, the Lennard River becomes a series to pools in the 3.5km long gorge. Walk the length of the gorge (7 km return) starting from the camping area and be sure to check out the amazing rock art. The shorter Time Walk takes you past fossilised marine life in the limestone walls. The gorge is home to 70 freshwater crocodiles around Bandingan Rock. On the walk keep a look out for corellas, wild donkeys, brumbies, frill neck lizards, sea eagles, brolgas and fruit bats. In the afternoon the water reflects the gorge walls making it an ideal time for photography and bird watching.The Windjana Gorge National Park is closed during the wet season as the roads are inaccessible. With deep, narrow canyons the Lennard Gorge is even more spectacular late in the wet season when the waterfalls are flowing. View the falls over the King Leopold sandstone from the lookout after a 2 km return walk from the car park. Within the King Leopold Ranges Conservation Park, Bell Gorge is a 30km (sometimes corrugated) diversion along Silent Grove Road. 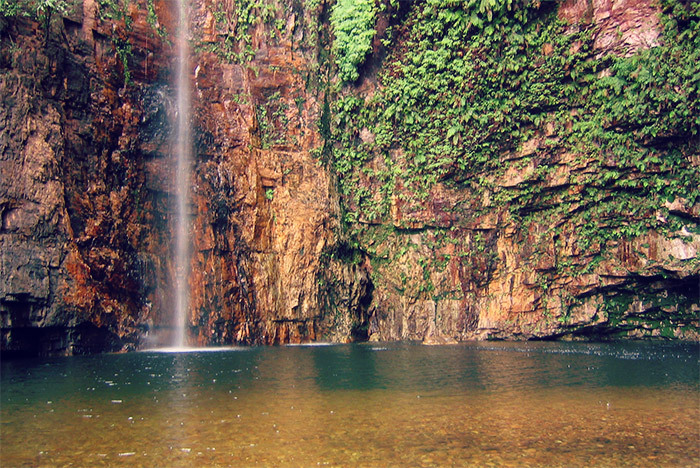 The 1km walk into the gorge is steep but a refreshing pool with a small waterfall awaits you. If you are looking for somewhere to spend the night, stay at the Silent Grove Campground. If you’re on a tight timeframe, Galvans is an ideal gorge visit because it’s only a 1 km detour off the road. 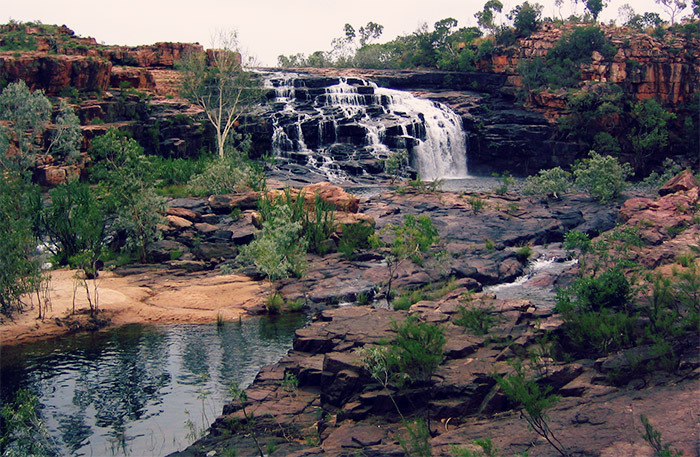 In the King Leopold Ranges, Galvans boasts a stunning horseshoe-shaped swimming hole with a seasonal waterfall. The pool will be too enticing not to take a dip. If you are looking for somewhere to stay, head to the Mount Barnett Roadhouse. One of the most stunning swimming spots in the Kimberley is Manning Gorge. Even if the waterfalls have stopped flowing, the reflective pools are an inviting swim opportunity. Set within the Mt Barnett Station, Manning Gorge requires visitors to climb a 3km trail to the top. A basic campground is available at the trailhead. The sparkling water of Emma Gorge is available via a one-hour walk in the El Questro Wilderness Park. They rate the walk as moderately-difficult with some rugged creek crossings. Located 100 km from Kununurra, the waterhole has an enticing shaded perimeter. Look for the small thermal water outlet trickling down the rocks. If you can cope with the cold water, swim out to the 65 metre droplet waterfall. If warm water is your preference, travel a little further to the thermal pools of Zebedee Springs. The oasis is surrounded by palms, pandanas and red cliffs. The springs are open to self-driving visitors from 7am to noon. El Questro has luxury suites, cabins and camping sites. Within El Questro, Chamberlain Gorge is picturesque with its 200 foot escarpment. Look out for wallabies, crocodiles and archer fish. Take a boat ride along the Chamberlain River to appreciate the scale of the gorge. The following is a suggested itinerary, customise the itinerary to suit your preferences and travel time available. Starting at Derby, drive 145 km to Windjana Gorge. Stay the night at one of the two campgrounds either the Quiet Campground or the Generator Campground. After setting off from Windjana Gorge head to Lennard River Gorge and Bell Gorge. Camp at the Silent Grove campsite or if you prefer a little luxury stay in a safari tent or homestead room at the Mount Hart Homestead in the heart of the King Leopold Ranges Conservation Park. After leaving Silent Grove head to Adcock Gorge and Galvans Gorge on your way to Manning Gorge. Stop at the Mount Barnett Roadhouse to pay your Manning Gorge entrance and camping fee. Fuel and supplies are available at the roadhouse. If you don’t have six hours of sunlight left, wait until tomorrow morning to take the Manning Gorge trail. Spend at least half a day enjoying the Manning Gorge walk and resting around camp. Tomorrow is a long driving day. Heading well off Gibb River Road, the Drysdale River Station is 1 million acres so there’s plenty to explore. There are two campgrounds available; at the Homestead and Miner’s Pool 5km away. The stunning Mitchell Falls and Plateau is a 4-6 hour drive to the north, depending on road conditions or consider taking a flight from the station’s airstrip. To really appreciate the size and beauty of Mitchell Falls, Prince Regent River and Kimberley coastline hop on a scenic flight or guided day trek which includes a flight, 4WD, walk and helicopter ride with lunch. It’s a six hour drive to Ellenbrae Station which offers visitors the chance to fish, swim and bush walk. Located only 5 km off Gibb River Road, it’s well worth stopping for their famous scones even if you aren’t staying the night. There are two campgrounds to choose from, both offering shady, secluded sites or stay in the cabins. It’s another six hours drive from Ellenbrae to reach the famous El Questro.Perched on the edge of a cliff, El Questro is a world-renowned resort not only for its unique accommodation but also the breath-taking scenery and adventure all around the 700,000 acre property. Spend the day visiting Emma Gorge, Zebedee Springs and Chamberlain Gorge. The Station offers several suggested itineraries for three, four or five night stays. Helicopter and airplane flights, boat tours, guided walks, fishing and horseback tours are available from the resort. The end of your Gibb River Road adventure finishes at Home Valley Station. The station offers shore and boat based fishing tours to catch a barramundi, salmon or mullaway sawfish. If you prefer to try a remote fishing location, you can opt for a helicopter fishing tour. Take in the incredible sights of the station’s gorges, lookouts, flora and fauna with seven self-guided walks. They cut Gibb River Road in the 1960s to transport cattle from the Kimberley’s stations to the ports at Derby and Wyndham. The 660km track takes you through national parks, stations, incredible gorges and ranges. Parts of the area are dated as far back as 375 million years. 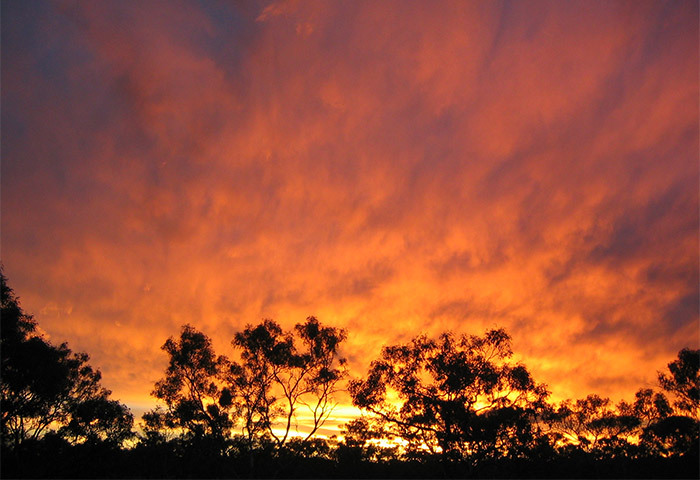 The region is steeped in Aboriginal history. A young freedom fighter known as Jandamarra (Pigeon) fought a battle at Windjana Gorge. There are also many stories of the adventures of the early white settlers in the area. To experience it all, you will need to give yourself over one week. If you prefer organised tours over self-drive tours, there are various day trips, extended tours and scenic flights running from Broome, Derby and Fitzroy Crossing and various stations in the region. May to October is the dry season in the Kimberley region and the best time to visit. During the wet season between November and April, the highway is open but there are road closures in the area. It’s also very hot during the summer months and the cyclone season is January and February with high flooding risk. June to August are the most popular months with visitors escaping the Perth winter to enjoy the high 20s to early 30s. The Hema Kimberley Map featuring Gibb River Road is an excellent resource with info on national parks, camping areas, roads and tracks. 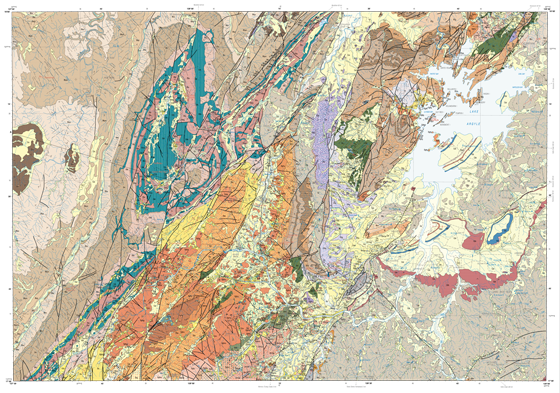 If you will be travelling around the Kimberley area, you may need the more detailed maps available in the Hema Kimberley Atlas & Guide. It features the top 10 4WD trips and 20 atlas pages and campsites, facilities and points of interest along the way. If you are interested in reading up about the history of the Kimberley region, check out Kimberley Scenes. The book is a collection of material written by people who involved in the exploration, prospecting and pastoral set-up in the late 1800’s. 100 Things to See in the Kimberley is a great new book written for anyone going to the Kimberley who wants to experience as much of the region as possible. It’s not specifically a camping or driving guide, it’s just purely the good stuff to see up there. If you are looking for a particular map or book, give us a call on (08) 9335 8665 or contact us online and we can give track it down for you.